This beautiful, 3 bedroom 2.5 bath home with 2600 sq. ft of living space is located in the Crown Point subdivision offers the ultimate in luxury and comfort. 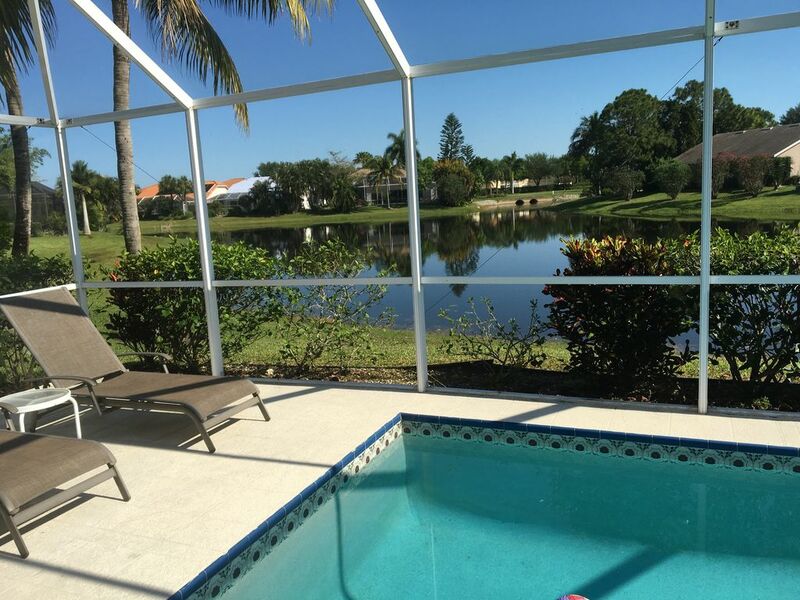 On a cul -de- sac this lake home has a beautiful private pool with covered lanai and Weber gas grill.A lovely setting for enjoying sunsets and dinners. An eat in fully gourmet kitchen recently renovated with granite countertops and new cabinets overlooks the pool and lanai. The family room with Flat screen tv dvd and stereo also leads out to lanai area.We have a formal dining area with seating for 8 and a separate living room furnished with a desk and fax machine for those who insist on working.The home is wireless. The home has a split floor design that wraps around the pool and lanai, the 2nd and 3rd bedrooms share a bath with soaking tub and shower and this section is closed off by a pocket door. There are twins in the rooms or the beds can be made into kings. Both bedrooms have their own TVs.The master bedroom suite overlooks the pool and lanai and offers a king size bed, flat screen tv, large closet,and reading area. The master bath has a soaking tub and walk in shower. The home has recently been renovated with new tile and carpeting and furniture. All you need are your clothes to rest and relax. Our home is professionally maintained and cleaned to the highest standards... come and enjoy! My husband Daughter and myself live in West Dundee, Il and look forward to our visits to Naples every year.We pride ourselves in keeping our home updated for our guests. We try to make it like home for everyone. We have been coming to this area for over 30 years for the fishing and shelling and general relaxation.We choose to buy our home in Naples because of the beauty of the area and all the wonderful activities in the area. We love the wonderful weather, beautiful beaches and sunsets and the relaxing way of life. It is paradise to us. We are a 5 minute drive to the river and 5th Ave shopping and all their wonderful resturants. We are another 4 minute drive to the beach. We are within minutes of many wonderful golf courses. After all of our activities during the day nothing beats coming home and having a relaxing drink,dip in our private pool while looking out over our lake and catching some of the sunset. We also enjoy grilling on our lanai and visiting with our friends. Lovely living room equipped with desk, fax, and printer . (5) Flat screen 65" TV in family room , DVD and blue ray, 36" flat screen TV in master bedroom ,42"in guest bedroom, 32" flat in twin room with DVD player and VCR , 26" flat in living room.